Substrate you choose in your aquarium is a vital part for any marine eco-system. Substrate will help you in filtering via beneficial bacteria. It will make your tank look good. It will also help in keeping some of the inhabitants stay alive. Nothing is wrong or right when it comes to selecting substrate. Its much dependent on what are your liking, some like dark and some like white. Crushed coral is heavy and porous material that provides larger area for beneficial bacteria to grow. Being heavy in nature your tank will have no sand storms. Cleaning crushed corals would be slightly tough and don’t mind the rough edges on the substrate. If you are planning for high flow in your tank and still want a cooler substrate the answer is this kind of substrate. Keep in mind if you are planning on the heavier substrate then the sand sifting species should be avoided at all cost. Lastly you would have to eventually replace some of the crushed corals in your tank as it would be next to impossible to clean the green/brown slime on them. Keeping sand in your marine aquarium is visually appealing to most of the hobbyists. Sand is made up of aragonite (a mineral consisting of calcium carbonate). It too helps in filtering but in lesser way compared to crushed coral. The grains of sand come in different sizes but still can produce sand storms with high flow. Sand will help you to some extent to buffer up the calcium and alkalinity. Some of the sand shifting species are now allowed to be kept. What I don’t like in sand bed is the when one side of the sand just flows away and leave bare bottom for display. Easy to clean compared to crushed corals and can be washed and re-used number of times. Some people like me just don’t like the idea of keep and substrate at all. Hence keep things simple with no substrate at all. Easy to maintain, have full control on the parameters and no sand storm in high flows. Anyway, bare bottom tanks look neat and clean, but some think that they don’t look natural which comes down to personal preference. Again, those sand shifting species should be avoided and the snales do a perfect clean up job. There is just one big risk in bare bottom tanks, if you are working of aqua-scaping make sure the rock doesn’t fall. As I had mentioned in the very beginning, that there is no wrong or write answer all types have its pro and cons. Finally, all falls on your personal preference, your visual appeal and your stamina for cleaning. 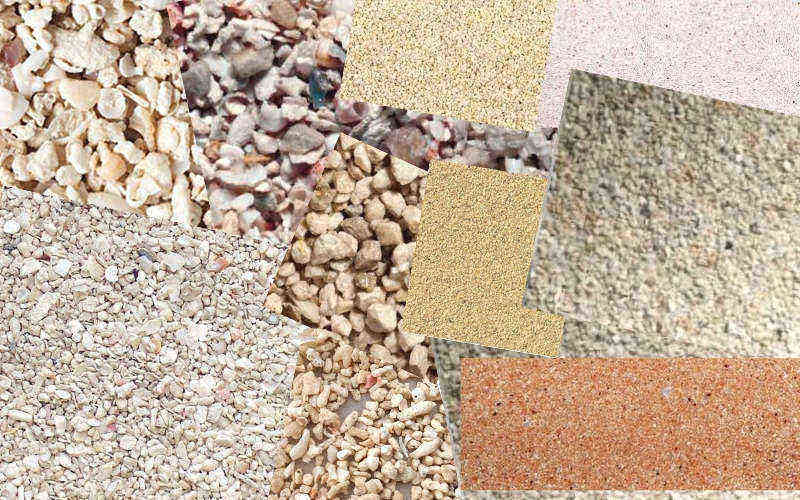 There is lot of color combinations in the substrate which I would take up in some other post. The crushed corals and aquarium sand are available with Amazon and Indian Aquarium in India.